Emerging Star will be a regular feature on NASL.com highlighting breakout performances over the course of the 2015 season. 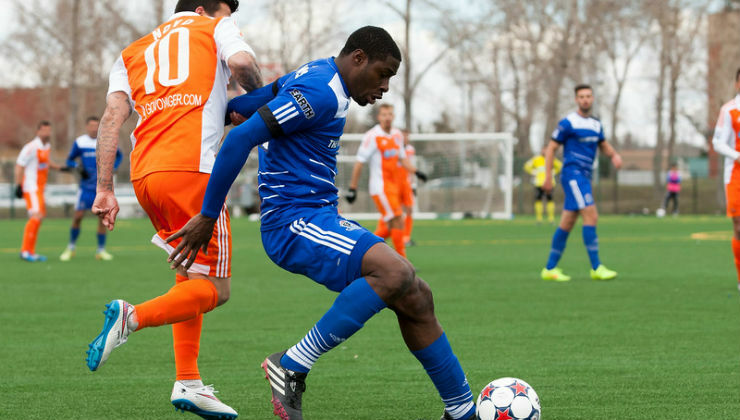 Kareem Moses traded in the Caribbean weather in his native Trinidad for quite the opposite when he joined FC Edmonton from North East Stars in 2014. The adaptation to life in Canada also presented a positional switch. The center back was moved to a left outside back position. Moses was able to get a run of matches in the position after Lance Laing was switched to an outside midfield role. Starting out the 2015 Spring Season, Johann Smith started the opening match in that role. Moses, however, would enter that match at halftime and hasn’t looked back. “From there I said, ‘This is my opportunity, and I’m going to take it,’” Moses said. Smith’s presence within the squad has spurred on Moses, though. Knowing there is competition, the Trinidadian defender knows he always has to be at his best. “When Johann was brought in, I knew it was competition because last season I was the only one playing at left back,” Moses said. “When he came in, I told myself that I have to work harder and do more and make him work for it, so that even if he gets the spot I would be pleased with myself. And playing behind Laing, who has played primarily as a defender in the past until recently, has helped Moses tremendously. “He helps me a lot,” Moses said of his teammate. “Knowing that he is in front of me I know that I have a good attacking player. I just give the ball to him and let him do his magic. Moses continues to grow in his role as a fullback, as he looks to re-gain a place within the Trinidad and Tobago National Team setup. And it’s his continued growth and versatility that could help the 25-year-old reach the international stage once more. For now, he is solely focused on his time with the Eddies and hoping to continue to build off of his strong form in the Spring Season.